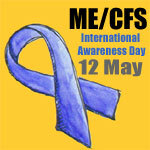 The 12th May is International ME/CFS and Fibromyalgia Awareness Day. During the month of May bloggers are joining together to help raise awareness and on this blog I’m collating a central list of all their posts. Their approaches and subjects may vary but the one thing they have in common is wanting to get a message to you. – Take and share a photograph that represents something about ME/CFS. Perhaps of yourself, your medication/suppliments, what you can see from your bed or something that represents a particular symptom. Share your photo with friends and family, on your blog, on social networking sites like Facebook, MySpace or Twitter (using Twitpic, Moby or a similar service). If you use a photo sharing site like Flickr considering adding your photo to different groups to raise awareness. For example the view from your window could be added to local groups, groups about city or garden views, self portraits, windows or even a group for the type of camera you used. Try think ing beyond chronic illness and health groups to try and reach people who may have no experience or knowledge of your condition. A multi faith worldwide event focusing on prayer and meditation will take place on 12 May 2009 to mark International ME, CFS, CFIDS, FMS Awareness Day. This inter-faith event welcomes participants from all religious and spiritual traditions, philosophers, free-thinkers and non-believers. It is a time to set aside our differences, in the knowledge that we all share similar symptoms with our health conditions and wish each other well. Just by linking-in, your thoughts and prayers will add to the input from others connecting to the network on this day and together we will generate something wonderful that radiates out into the world…like a lighthouse, that beams out a light signal and helps to guide each individual on their way. All are welcome to join in and support those with ME, CFS, CFIDS, Post Viral Fatigue Syndrome, Fibromyalgia Syndrome and related conditions such as Multiple Chemical Sensitivity or Chemical Injury and Myofascial Pain Syndrome. You are invited to make a prayer, meditation, visualisation or even just a wish on 12 May between 12 noon and 12.30pm local time. Awareness Week is celebrated throughout Australia during the week of 10th – 16th May 2009 and International Awareness Day is on the 12th May and is recognised throughout the world. North Coast CFS/FM/ME is celebrating the occasion on the 13th May with a sausage sizzle in the Boathouse Park. All who suffer from this disease are welcome and information on the subject of CFS/FM/ME will be available.